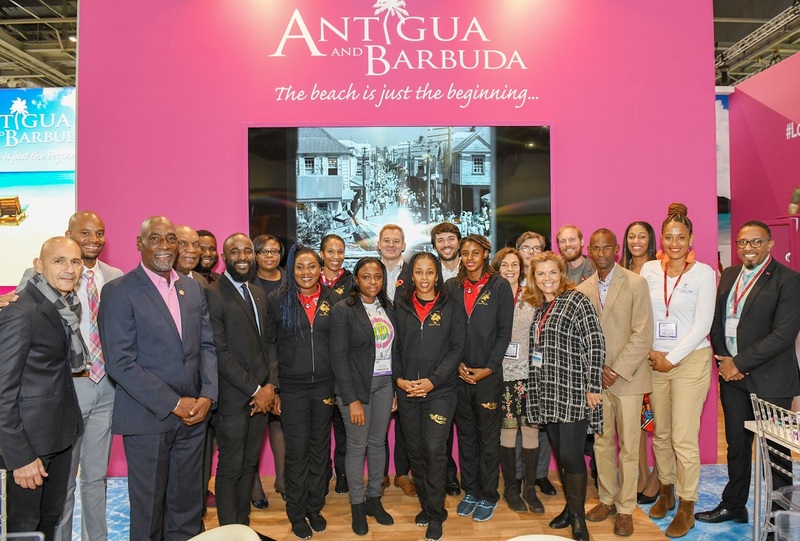 The Antigua and Barbuda Tourism Authority has just completed a successful week at London’s World Travel Market. Held annually, WTM is the world’s leading conference for the travel industry and takes place in London’s largest exhibition centre, ExCel in the Docklands. The three-day event welcomes over 50,000 exhibitors, buyers, media, and industry professionals for a chance to network and negotiate with members of the tourism community. The Antigua and Barbuda tourism team included Colin James, Chief Executive Officer of the Antigua and Barbuda Tourism Authority, Asha Frank, The Barbuda Council’s Chair of Tourism, Culture, Sports and Youth Affairs, cricketing legend Sir Vivian Richards, and Cherrie Osborne, Director of Tourism UK & Europe. The strong presence of Antigua and Barbuda’s High Commissioner to the UK, H.E. Karen-Mae Hill also provided additional support to the team. Over the three days, ABTA hosted over 40 meetings with a variety of top tour operators, suppliers and some of the UK’s most influential media. The Tourism Authority shared news and hotel openings for 2019 including the highly anticipated launch of Hodges Bay, the opening of Hammock Cove, and the reconstruction and reopening of the Barbuda Belle. Sporting news was dominated by the girls this year with news of the Team Antigua Island Girls entering the forthcoming Talisker Whisky Atlantic Challenge as well as the approaching T20 tournament. As tourism ambassador for the island, sporting legend Sir Viv Richards was on hand for several interviews with radio outlets including BBC Radio 5 Live, 5 Live Sportsweek, TalkSPORT and Asian Network as well as top tier titles such as TravelMole, The Cricketer and Trinity Mirror. CEO, Colin James captivated a huge audience at his much-anticipated panel on the successful influencer conference held in Antigua in April this year entitled ‘How Caribbean Islands Can Work With Influencers – a case study Antigua & Barbuda’. Speaking to a crowd of the UK’s top bloggers and industry experts, the discussion focused on why the ABTA decided to become the first Caribbean island to undertake such an endeavour as well as how to drive tourism figures using new digital strategies and harness the powers of social media and influencers. He revealed the results of the campaign and also hinted at new developments for another conference for next year. For more information on Antigua visit www.visitantiguabarbuda.com.